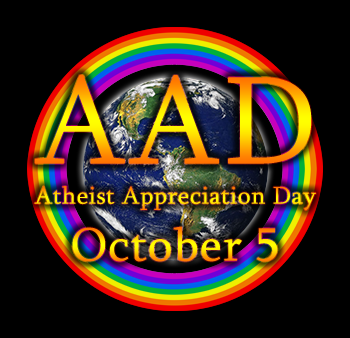 October 5 is Atheist Appreciation Day. Saying or writing "No Comment" on this day, in response to any question, is the means by which many wonderful people have some fun celebrating this fine international annual tradition of showing appreciation for atheists everywhere. Although any day can be Atheist Appreciation Day, to formalize it as an annual celebration the Month and Day upon which this idea was inspired, October 5, is what this tradition is set by (since it was first practiced in 2013). Now, if anyone asks you "Did you celebrate Atheist Appreciation Day?" you can reply ironically with "No Comment" knowing full well that it will mean much more than that. Why the phrase "No Comment," you might wonder? Well, since atheism is the "absence of belief in deities," we figured that this comment really says it all, and since it's often "shied away from," we thought it would uniquely be one of the best phrases to be adopted by atheists since it summarizes atheism so beautifully and in so many ways. © 2013-2019 Inter-Corporate Computer & Network Services, Inc., unless otherwise stated. All rights reserved.